Our College Library has been built to International Standards, Spread over an area of 60,000sq.ft. It is centrally air-conditioned. Specialized collection of books, Journals & Non-book materials are available in Basic Sciences, Engineering and Technology, Biotechnology, Humanities and sciences. The collection is replete with 1,04,397 Volumes of Books, 8,292 Titles & 550 CDs. The college has access to 1,273+ e-resources, ASME Journals, IELonline, Springer Link. Network Connections:Internet connection through fiber optic. Indian Institute of Technology,ChennaiAnna University,Chennai. Standard textbooks and books by well-known authors are stocked,and every effort is made to obtain all titles recommended by the faculty. 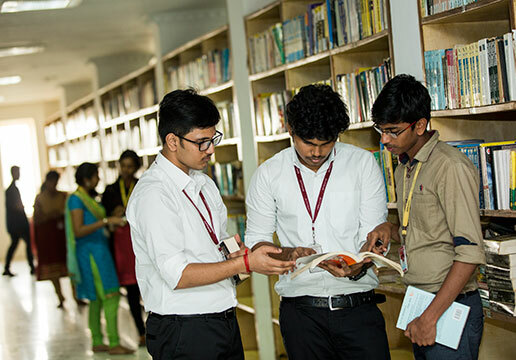 All Students,faculty and Senior Administrative Staff are members of the library. All the books are bar-coded in the library and barcode laser scanners are used in the circulation counter for book transaction.